And then it was spring! This was a good weekend. Not so much Saturday with blustery cold winds and stray snow and rain…. more so Sunday with calm sunshine and some of the highest temperatures of the year! Of course Saturday (the cold day) was the open day for Hitch Lyman’s garden, so trust me you’ll hear more about that, but for now I just want to bask in the warmth that was. Pansies were on the list and Perennial Point did not disappoint. Perennial Point is my go-to nursery for the best plants in my neck of Pennsylvania. This was their opening weekend, and I’m always glad to see them back especially after nearly losing them three years ago when the Susquehanna River flooded, spreading plants far and wide and covering the whole place in over ten feet of rushing water. They’ve rebuilt, and the new and improved is overflowing with spring goodies. Here’s the interior filled with more delicate things not ready for the frosty nights. 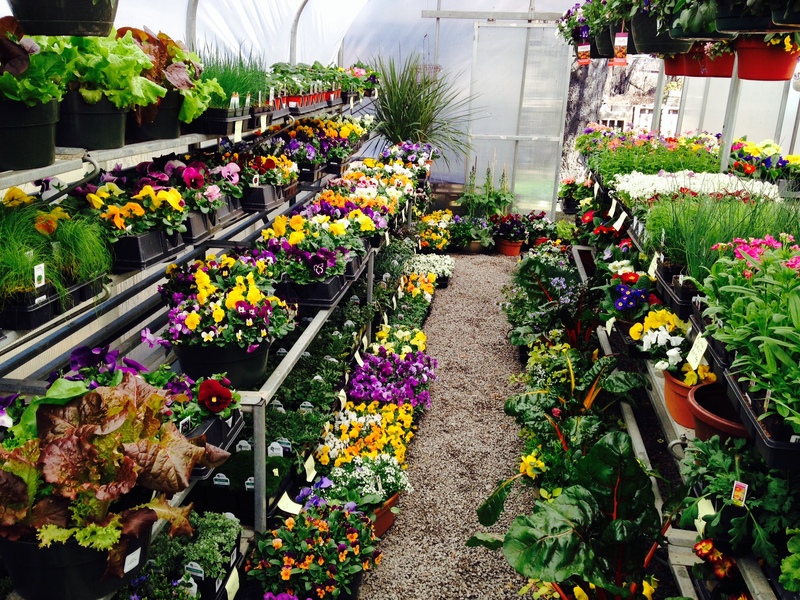 A spring greenhouse overflowing with all that’s good about ending winter. I have to say my daughter was very patient while I looked around. Not every 5 year old tolerates plant shopping as a follow up to her first day of T-ball practice. Stopping for chicken nuggets helped, and she got to pick out one of these trays of primula for mommy. How could I not at $4.59 a tray (four plants)!!? Some perfect primulas. I hope the ones I bought stay this nice for at least a week or two. I could have hung out for a while among the spring color and fragrance, but ice cream was promised so off we went. I wanted to carry out another spring tradition, the visiting of a local spring snowflake patch near the ice cream shop. The snowflakes (the good kind!) were in full bloom and although there were fewer than in years past (there’s been some careless construction going on) there was still a nice patch filling the creekside hollow. Naturalized snowflakes (leucojum vernum). Notice the cool green tips on the flower petals? This entry was posted in annuals, early spring, spring bulbs and tagged leucojum vernum, pansies, spring, spring flowers, spring gardening, spring snowflake. I did not know you were planning a trip to Hitch’s. I have been in other years and I am interested to hear your impressions. I am also wondering how far you are from Binghamton and Ithaca. I’ve been back to read the post on your Temple Garden visit a few times, I need to check it out again! It was a little over two hours for us to get up there, I’m about 45 minutes south of Binghamton. I had a great time visiting, but the rest of my party was much less enthusiastic about looking at endless snowdrops in a cold wind under grey skies! I love snowflakes too – some new ones I planted last autumn have only just come up. They are called Gravetye Giant and are tall and simply gorgeous. I’ll have to try and get some pictures. Thanks for the info about them drying out though. I shall have to water my whole garden more frequently as all my bulbs suffer if we have drought. Enjoy those colourful primulas and have a sunny week! Rain again today, but at least it’s not snowing! I like Gravetye Giant but don’t have it. Did you notice if it has a fragrance? It looks like it should, being all lily of he valley like. Got up close for the photo today and couldn’t detect a fragrance. It’s a beauty though. I was surprised it’s so late, but pleased. Oh well. Can’t have everything! Sometimes the late things are a nice surprise just when you thought everything was over. Brilliant, you were able to enjoy some of the joys spring brings! Happy spring! My snowflakes are increasing here which is wonderful, they are such beautiful flowers.How wonderful that you have them growing wild in such numbers. You obviously had a wonderful day out, spring is such a wonderful time of year. 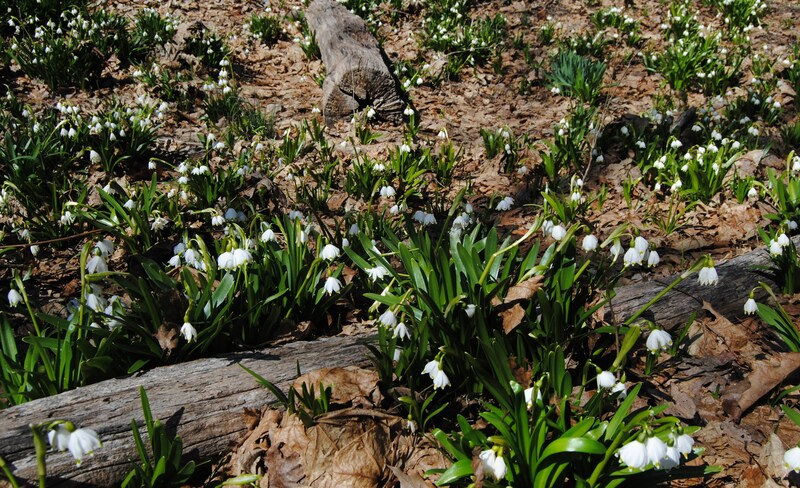 I love Leucojum vernum. Are these growing wild by the creek? I suppose all our garden plants are wild somewhere, but it does seem amazing. I think they’re a near relative of snowdrops and are native to Europe. Here they’re the legacy of a Victorian era gentleman’s farm. They’ve probably been growing uncared for and doing their own thing for the past 100+ years. Sorry to hear the bulbs you planted failed, I’m sure the ones from your sister will do much better. Gifted plants always seem to do the best! All this colour, you must be in a spring frenzy, Frank. I also love Leucojum and just notice that I’ve never had any in my garden. This has to change! You bet Annette! 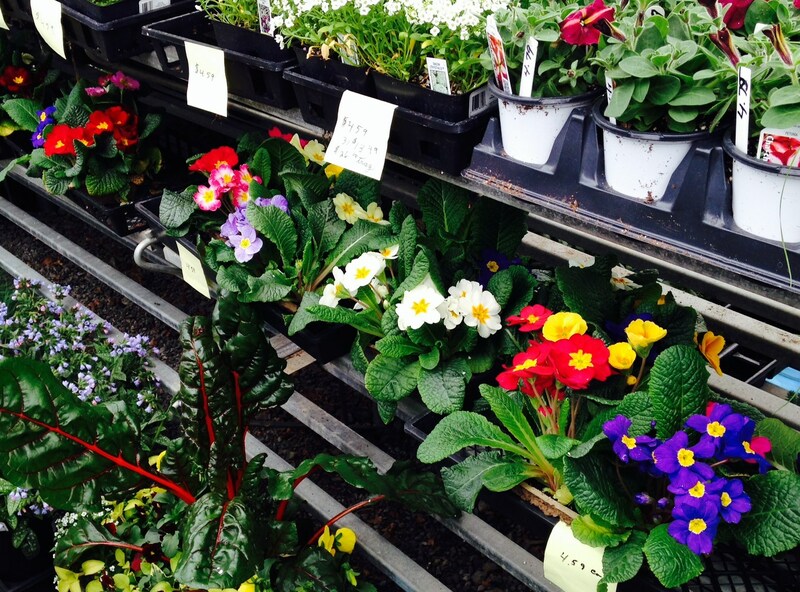 I just took a deep breath of the springtime fragrance and tried not to go too crazy with cool weather plant buys. Pansies are always a must for me, I feel like it’s the official declaration of springtime’s birth! I have a few v. cornuta seeded out, I think I read somewhere that they are more likely to act as short lived perennials….. And the flowers are so much more refined? (I think that’s the wording want?) hybrid pansies are much more of a hammer to the head kind of spring- which is just what I need right now! I stand reminded that I need some of those unusual spring snowflakes. I’ve seen the yellow edged type and they are special indeed. I’ve been following some of the SRGC threads on unusual snowflake types found in the wild. There are so many other variations out there…. Unfortunately it’s doubtful any will ever find their way here in my lifetime! I read in your reply you are south of Binghamton. That is a nice area. I go through it each visit back to my home town in PA. I see why you get the snow too. Pansies are one of my favorites. I just love there happy faces this time of year. Well most years anyway. Still a bit iffy on snow here, some still predicted. Yeah I know what you mean by iffy, we’re still getting some good freezes here but I think they’ll be fine. I need something to remind me that warmer weather is coming! I don’t have any snowflakes, but I did go to my neighborhood nursery today and bought four flats of pansies, plus two six packs of stock. Hurrah for spring! Nice. 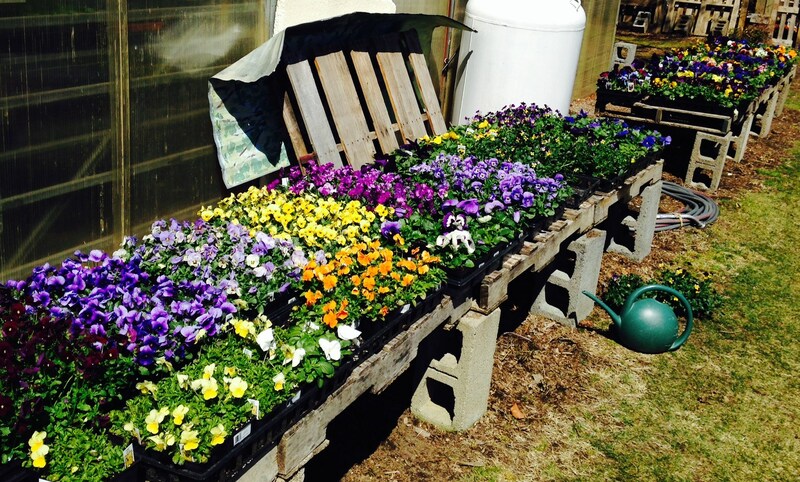 I don’t think you can ever have too many pansies, but I rarely see stocks around here. Maybe I need to look a little harder! hah hah! My kids (one of them at least) still look for me at games. I wonder how long that will last! If you are in Scranton might as well visit Corky’s Garden Path and Greystone Gardens, they’re just up the road and you can do them one after another. hmmmmm. I’m due for a visit myself!